There are 2 ferry routes operating between Gran Canaria and Fuerteventura offering you combined total of 34 sailings per week. Naviera Armas operates 2 routes, Las Palmas to Puerto del Rosario runs 5 times per week & Las Palmas to Morro Jable about 8 times weekly. 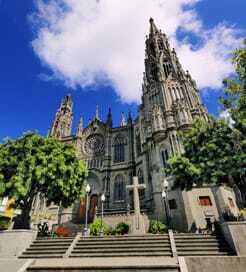 Fred Olsen Express operates 1 route, Las Palmas to Morro Jable which runs 3 times daily. As the frequency and duration of crossings on some routes varies we would advise that you do a live search for crossings from Gran Canaria to Fuerteventura to get the most up to date information. Fuerteventura is the second largest island of the Spanish Canaries, measuring around sixteen hundred square-kilometres, and also one of the most popular. The coast of Africa lies just over a hundred kilometres away, so it comes as no surprise there are many similarities between the two, particularly in the landscape and architecture. Rolling, arid hills speckled by flat-roof houses dominate the vistas, whilst the island itself boasts three thousand hours of annual sunshine. Fuerteventura’s biggest draws, however, are the incredible surf breaks and beaches, suitable for everyone from families to water-sports fanatics. It’s also the oldest island of the archipelago, dating back twenty million years. Consequently, there are some fine historical museums such as the famous Betancuria Museum of Archaeology and Ethnography. 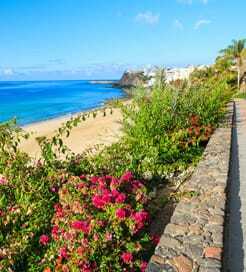 As one of the most visited islands in the Canaries, Fuerteventura is well served by ferry and easily accessible from almost every other island. However, the journeys can vary in length. Sailing from Lanzarote takes just over half an hour, whereas overnight crossings are available from Tenerife, so be sure to book a more comfortable cabin for these routes.